Installing a roof fan is the most effective way to ensure adequate roof ventilation. Roof fans are also known as roof vents, roof exhaust fans and roof extractor fans. 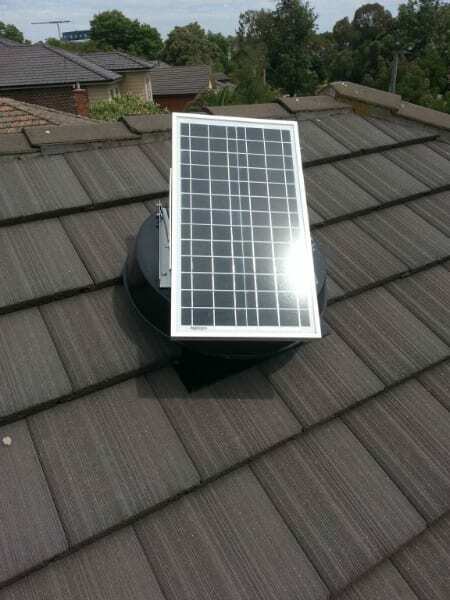 The Solar Whiz roof fan is available both for domestic and commercial ventilation applications. In this post we will only discuss domestic roof ventilation applications for roof vents. If you wish to know more about commercial applications, please visit the commercial ventilation page. Roof fans are, as the word indicates, mounted directly on the roof and are designed to remove hot air from overheated roof spaces. This prevents heat from penetrating the insulation and ceiling. Hot air can only be removed if replacement air is available via openings into the roof space. These openings may be “natural openings” into the roof cavity, e.g. openings between tiles or corrugations in tin roofs. However, often we recommend to install passive vents in the form or eave vents or ceiling vents. Roof fans are often referred to as a roof vent. However, active roof vents should not be confused with passive roof vents. Read more about roof vents. When installing the roof fan in conjunction with ceiling vents – it is often referred to as a roof ventilator. Roof ventilators are, in these cases, drawing replacement air from the rooms in which the ceiling vents are installed. The ceiling vents will often be installed in rooms that get warmer than the the rest of rooms throughout the house. E.g. rooms on the western side or northern side of the house – and most frequently upstairs rooms. Upstairs rooms tend to get much warmer than down stairs rooms. Therefore, “double dipping” by using the roof extractor fan – not only to ensure good roof ventilation, but also extracting hot air from the upstairs rooms, is a great way to ensure you get the most out of your roof ventilation products. Throughout Australia roof space temperatures frequently reach temperatures between 60 and 70 degrees Celsius. At such high temperatures the heat will very quickly start to enter the house, making it uncomfortably warm. Or, if you are using air conditioning, causing the A/C to switch on earlier than necessary. Roof exhaust fans will reduce the heat load on the whole house. As mentioned above – especially in warm or hot rooms, which have had ceiling vents installed in them. Furthermore, roof ventilators will help increase the efficiency of ducted air conditioning systems. When the roof fan extracts the hot air from the roof space, the heat gain in the ducting from the air conditioning unit is reduced. Less energy is therefore required to achieve the same amount of cooling. If the air conditioning unit itself is placed within the roof cavity, you can imagine how much harder the unit has to work to supply cool air if the roof space is 65 degrees Celsius – than if the temperature is close to the outside ambient temperature. Therefore having a roof fan installed can not only increase your comfort significantly – it could also save you hundreds of dollars on your air conditioning bill every year. If you would like to know more about how you can increase the efficiency of your air conditioning system through ventilation of your roof by installing a roof fan please visit our air conditioning webpage. Get a quote from the market leader in solar roof ventilation by calling us on 1300 655 118!